Coaster Storage Bed Sandy Beach in Cappuccino CO201990BED. The Sandy Beach storage bed beautifully crafted with maple veeners. Details like traditional turnings, paneling on the woodwork, and clean, straight mouldings add visual detail to the collection's design. 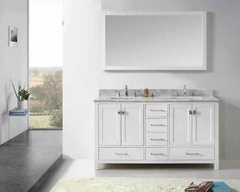 This collection features a rich cappuccino finish that instantly warms and comforts. including an assortment of case pieces with convenient storage options. Full extension glides makes organizing and storage simple, and felt-lined top drawers safetly stores jewelry and other treasures. Do not forget to add Mattress to your new Storage Bedroom Set. 1 x Oueen Storage Bed CO201990Q. 1 x King Storage Bed CO201990KE. 1 x California King Storage Bed CO201990KW. 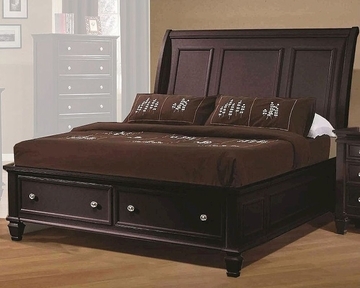 Queen Storage Bed – 62.25"W x 97"D x 57"H.
King Storage Bed – 77.25"W x 97"D x 57"H.
California King Storage Bed – 73.25"W x 101"D x 57"H.
Constructed of solid wood and maple veneers. English dovetail drawer construction increases strength & stability. Full extension drawer glides create a smooth open and close process.